Colts striker Stephen O'Neill tries to find a way through the Strollers defence. 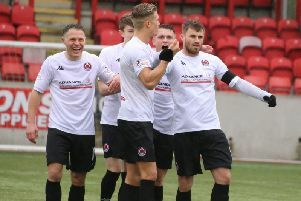 Cumbernauld Colts made it three in a row as they saw off Lowland League new boys Civil Service Strollers at Broadwood on Saturday. In what was the first match between the two sides, both had their fair share of early possession, creating a couple of scoring chances without troubling either goalkeeper too much. Johnny Black whipped over a free-kick from a wide left position and the ball managed to evade everyone in the box to sneak in at the goalkeeper’s near post. Shortly after the restart Strollers showed real intent to get back into the game with a shot narrowly off target. They were causing problems, most notably when Black was caught wrong side of the Strollers’ striker in his own box and made a clumsy challenge which brought down the forward. But the referee however deemed this not enough to award a penalty, much to the discontent of the visiting players. Colts created a few chances to score but to no avail. New Colts number nine Ross Kavanagh looked lively throughout the game, but missed the best of the chances when he found himself unmarked in the box with an open goal in front of him only to head wide. Colts keeper Fahey made two comfortable saves just before half time which saw Colts head in 1-0 up at the break. The second half did not go the way either team had hoped. Colts enjoyed a greater share of possession but failed to create much in front of goal and at the other end Colts’ defence remained untested. Despite a series of substitutions from both teams in the second half, the game fizzled out.